Fumiko and I had our usual lunch date. I had leftover pasta alla puttanesca, she had made this absolutely delicious spaghetti bathed in cream sauce with artichokes. She says this is very easy, so i will need to try making this myself. Something about having 2 kinds of pasta in one sitting–one with red sauce, the other with white sauce– that is very satisfying and indulgent. Matt and I had tickets to see Do Say Make Think at Southpaw in Park Slope, Brooklyn (great venue). But before we met up, I had a gallery opening at work that I was helping out with– all strategically planned out because I knew I could munch on hors d’oeuvres and drink to my hearts content, essentially just eat dinner there without having to spend a dime. Genius. However, the sushi they served was pretty horrifying– big fat rolls with too much sweetened rice and not enough insides. and just really poorly rolled too, I could have easily done a better job– they were just damn ugly. It was pretty uncharacteristic too, cause the food served at my work’s receptions aren’t usually so bad. But I sucked it up and ate as much as I could– you really can’t be picky when you are on a tight budget. I think I’m finally starting to understand that. Ok, so I head out after two glasses of bad chardonnay and a stomach full of the worst California rolls I’ve ever had in my life. Meet Matt at Union Hall, he offers me a beer, and recalling my ground rules, I accept on the grounds that I can treat him to a slice of pizza. Fair trade, no? Wait a sec, back up– Kayoko, didn’t you just have your dinner? You are supposed to be fulfilled by the 10 or so pieces of sushi you JUST consumed. Folks, here’s another thing about me and my eating habits: I cannot tolerate having an unsatisfying dinner. God, that’s horrible and sounds snobby and self-entitled. Ugh. But it’s true– yes, I did have dinner, technically, and I wasn’t really hungry anymore– but I just couldn’t let that be my dinner. It was out of the question. So I’ve had this weird obsession with pizza lately, and I’m always craving a slice. We headed to this random pizza place that is right off of Union and 5th Ave. It was sorta creepy, I wish I had taken pictures of it. Yellowing wallpaper and really bizarre garage sale chachke displayed everywhere. And the price chart hanging overhead was one of those really old school ones where you have to put up each letter one by one, like a theater marquee. You know what I’m talking about? This one had a 7Up logo on it– remember when 7Up was huge? This place had probably been around since at least the 70s. Do the Right Thing, baby! I got a slice with sausage piled on top, it was very satisfying– totally worth the $, just so I could go to bed knowing that my dinner weren’t those nasty california rolls. Sidenote: Do Say Make Think were excellent live. I guess some of the musicians play with Broken Social Scene (both outta Toronto). They create a wondrous cacophony of noise that, along with the light show, made me think of what it would sound like if a spaceship landed in Brooklyn. Feeling groggy and heavy (it’s the bad wine), so I got a croissant on my way in. Aya’s incredible Nappa-wrapped pork. what a treat!!! Here is where things get a little tricky for $100/2 weeks/NYC. We had made plans to go to a movie at Film Forum with work-related people a while back, so I couldn’t really back out of this, even though I fully knew what this meant: eating and drinking with them. CRAP. Finding a wallet-friendly meal is hard enough, but tagging alcohol onto the bill is guaranteed to drive the bill up. So I did my best to suggest a place that would be “affordable”, i.e. under $20 (even that was pushing it). I always have a really difficult time finding a place to eat around Film Forum. 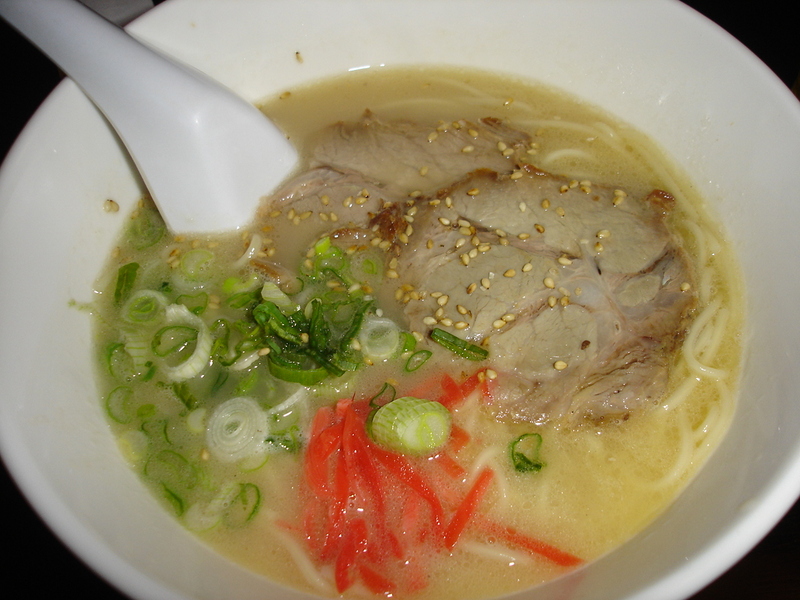 I had heard from various message boards that Rockmeisha in the West Village served good ramen, so we met there at 8pm. We ran into Aya and TMonkey there– I’ll let TMonkey really talk about the ramen cause he’s doing this taste test of different ramen joints in the city and will be reporting on it. But just let me say that Rockmeisha’s ramen is just another disappointment in the consistently depressing ramen scene in NYC. The only place i’ll go to that is DECENT is Menkuitei in midtown (NOT the one in Cooper Square- same shop, but the ramen is not as good). But the roasted pork at Rockmeisha was good- flavorful, just the right amount of fat, and thinly sliced- I’ll give them that. the noodles, too soft. the soup, not enough depth, despite the heaviness. Someone, i beg you, open up a ramen shop that is at least CLOSE to the ramen in japan. PLEASE!!! And the thing is, ramen is NOT CHEAP. this little bowl of tonkotsu ramen that I slurped in under 10 bites? $9.95!!! Dude, I could go to Great NY Noodle Town in Chinatown and get 2.5 BOWLS of their shrimp dumpling noodle soup that trumps this stuff ANY DAY. makes me mad just thinking about it. 3 beers, a starter of hiyayakko (cold tofu) and edamame, and 4 bowls of ramens later, the bill came to be exactly $20 each. I was proud that I didn’t go over that, but not proud that I now officially have less than $30 left and I have only reached the halfway point of $100/2Weeks. WAAAAAAAA!!!!! ps- i am sorry i didn’t take enough pictures in the last 2 days! This entry was posted on March 30, 2007 at 5:41 pm and is filed under $100/2wks/NYC, *Kayoko, Brooklyn, budget, Japanese, Lunchbox, new york, Pizza, Ramen. You can follow any responses to this entry through the RSS 2.0 feed. You can leave a response, or trackback from your own site. I LOVE LOVE LOVE NY Noodletown!!!!! I can’t wait for soft-shell crab season!!! I love their noodle soups as well as their flowering chives dishes. You can get so much food for so little money. Plus they’re open late!